Basking shark fisheries have existed in temperate waters all around the world, including Scotland, Ireland, Norway, Iceland, California, China, Peru and Ecuador. Basking sharks and whales have always been hunted by humans who value the oil and other commodities they provide. The historic cottage industry in shark fishing used the liver oil for lighting and in the tanning process. The meat was used for food and the rough skin for shark skin leather . Basking shark fisheries have existed in temperate waters all around the world, including Scotland, Ireland, Norway, Iceland, California, China, Peru and Ecuador. Basking shark liver oil is rich in squalene, an oil typically found in deep-sea sharks. In the 20th century shark liver oil has been used in the aviation industry as a lubricant, as a cure-all tonic, as a vitamin supplement and in cosmetics . The oil is used in the tempering process for high-grade steel. The flesh has sometimes been processed into fishmeal. The price of basking shark liver oil fell in the late 1980s and it seemed that the basking shark fisheries would become unprofitable and cease to exist. Unfortunately the falling demand for shark liver oil has been counterbalanced by a rising market for sharks’ fin soup. As China becomes more affluent this demand will only increase. One basking shark can yield 90 kg of fins. As dried shark’s fins may cost US$600-700 per kg this makes the easily transported fins an irresistible fisheries target. The apothecary shops in Hong Kong display the huge fins in pride of place and there seems to be no inclination to change this practice. Basking shark skin is very rough. It used to be tanned and made into leather for non-slip boot soles for fishermen. This photograph was taken from a kayak off Niarbyl, the Isle of Man. Picture: Shane Stigant. 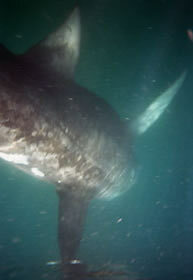 Seasonal basking shark fisheries have existed for hundreds of years. Originally hunting methods were much the same as for whales, hand-held harpoons being used from small boats. Basking shark fishing was a very hazardous activity as the newly harpooned sharks immediately ‘sounded’, diving deep and struggling. During the 20th century hand held harpoons gave way to non-explosive harpoons fired from small whale guns. The Irish Achill Island basking shark fishery initially used harpoons but later set-nets were used to trap the sharks in shallow water which were then harpooned. Presumably this was safer for the fishermen. Dead basking sharks are slightly denser than water. This means that they would sink’ so it was common practice to inject air into the dead shark to keep it afloat. The 20th century saw a thriving basking shark fishery in European temperate waters. Between 1946 and 1986 basking shark fisheries in Norway, Scotland and Ireland took 77,204 basking sharks. The success of these basking shark fisheries varied enormously from year to year as sometimes the basking sharks arrived in enormous numbers and there were hardly any in other years. In good years it could be hugely profitable. Gavin Maxwell, who is most famous for his best seller “The Ring of Bright Water”, had a basking shark fishery off Soay, Scotland in the 1950s. It became one of the fisheries most famous economic failures as this escapade in Maxwells’ life produced a very readable account of the methods of the time in his book “Harpoon at a Venture”. Between 1947 and 1975 there was a thriving basking shark fishery operating out of Achill Island, Co. Mayo, Republic of Ireland. Between 1947 and 1975 they took 12,360 sharks. The Achill catches peaked in the 1950s and then fell sharply after 1956 as shark numbers declined. This decline was attributed to over-fishing of a local population. It can be too simplistic, however, to assume a straight relationship between intensive fishing and the decline of a fish population. When Drs Sims and Reid examined the relationship between historical plankton data and basking shark catches of the Achill fishery they concluded that the decline was probably due to a local decline in the basking sharks foodstuff rather than to over-fishing. Until very recently the Norwegians have had an active basking shark fishery, being responsible for landing the majority of basking sharks in the NE Atlantic. In 1970 they took 18,700 tonnes and in 1975 18,352 tonnes and then it slowly declined. Norway landed approximately 28,526 individuals basking sharks between 1989 and 1997. Bizarrely enough, given the laws to protect basking sharks in European waters, until very recently they had a quota from the EU that allowed them to take 100 tonnes of basking shark liver per year. This was in exchange for a quota of white fish taken from Norwegian waters by UK fishermen as part of an overall fisheries Agreement.